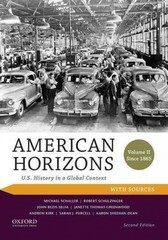 American Horizons 2 Edition American Horizons, Second Edition, is the only U.S. History survey text that presents the traditional narrative in a global context. The authors use the frequent movement of people, goods, and ideas into, out of, and within America's borders as a framework. This unique approach provides a fully integrated global perspective that seamlessly contextualizes American events within the wider world. The authors, all acclaimed scholars in their specialties, use their individual strengths to provide students with a balanced and inclusive account of U.S. history.Presented in two volumes for maximum flexibility, American Horizons, Second Edition, illustrates the relevance of U.S. history to American students by centering on the matrix of issues that dominate their lives. These touchstone themes include population movements and growth, the evolving definition of citizenship, cultural change and continuity, people's relationship to and impact upon the environment, political and ideological contests and their consequences, and Americans' five centuries of engagement with regional, national, and global institutions, forces, and events. In addition, this beautifully designed, full-color book features hundreds of photos and images and more than 100 maps.